We also require a £50 good housekeeping bond, this is additional to your holiday price. Your bond will be refunded to you within a week of your departure and after our cleaners have checked the caravan, this will be done via bank transfer and you will receive an email when bond has been returned to you. Your beds will be made up ready for your arrival with fresh linen and fresh towels will also be provided for each guest. If requiring Club passes, these also can be obtained from reception (for a small cost). not everyone requires them, so we try to be fair and keep the costs down for each individual booking. 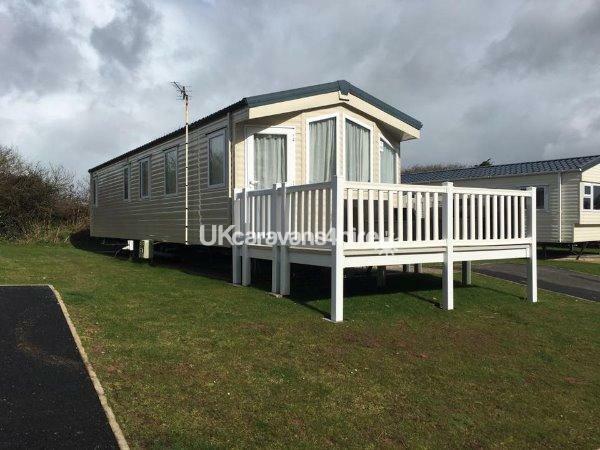 We would like you to make special memories in Cornwall whilst staying in our spacious, comfortable, immaculate caravan with a hint of luxury. 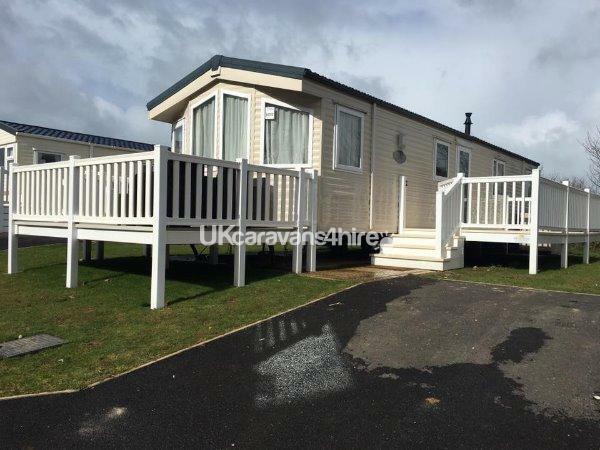 Our caravan is situated in a new & quiet area at the top of the park, where you can have breakfast on the decking whilst enjoying the morning sun and a BBQ and a glass of wine in the evening whilst watching the sun go down. 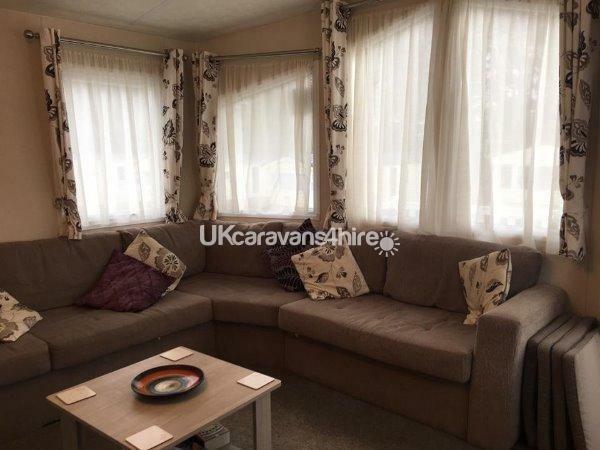 You will find our caravan in an immaculate condition, it's very light & airy due to plenty of large windows. There is plenty of seating in the lounge, with a wall mounted LCD TV, dvd player & gaming console. 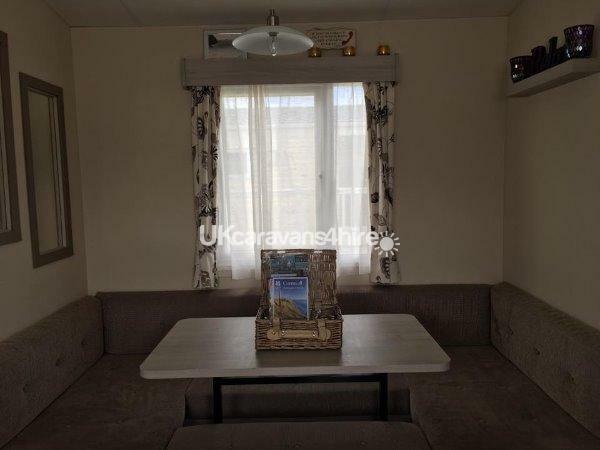 The 2nd bedroom has 2 comfortable single beds, wardrobe & overhead storage. Our spacious bathroom comes fully equipped with a enclosed modern walk in shower cubicle, sink & toilet and a heated towel rail. 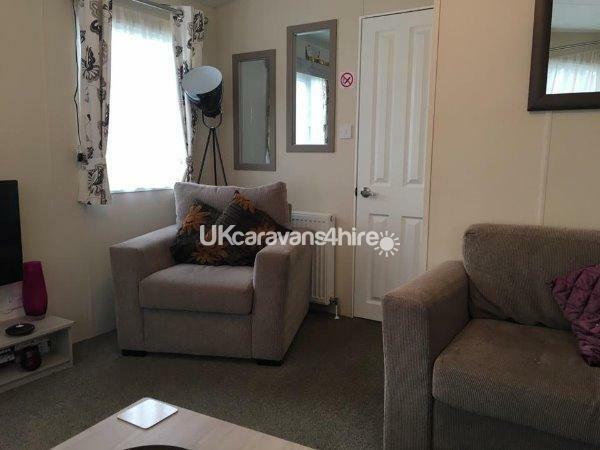 The caravan is fully double glazed & centrally heated, however there is a gas fire mounted on the living room wall for chilly evenings. A clothes airer, ironing board & iron & hairdryer are also provided for your use. 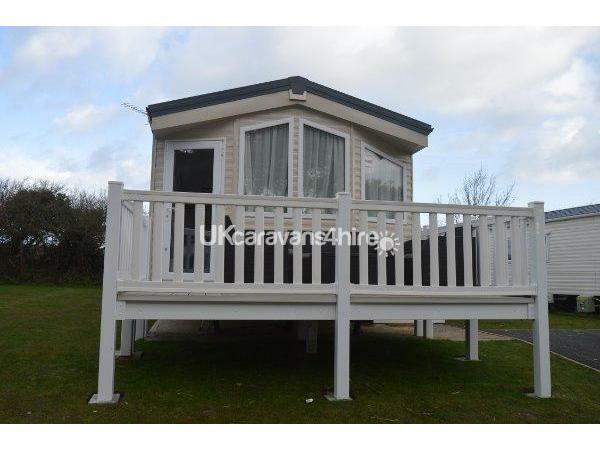 There is a small enclosed decked area that can only be accessed from the living room where you can enjoy the evening Cornish sun going down. 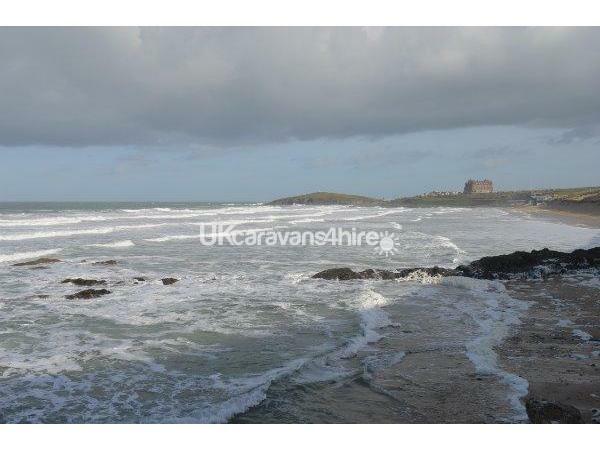 Newquay Holiday Park is only 2 miles from Newquay town centre. A choice of 11 stunning beaches including Watergate bay and the famous Fistral beach which is ideal for surfers, or why not pamper yourself at the award winning Headland Spa in Newquay. THERE IS A REGULAR BUS SERVICE THAT RUNS INTO NEWQUAY FROM RIGHT OUTSIDE THE PARK ENTRANCE..... TO NEWQUAY, TRURO ETC. We have tried to cover just some of the activities & attractions for all the family, but this is just a small sample of things to see & do in this beautiful part of the country...there is so much more to explore. 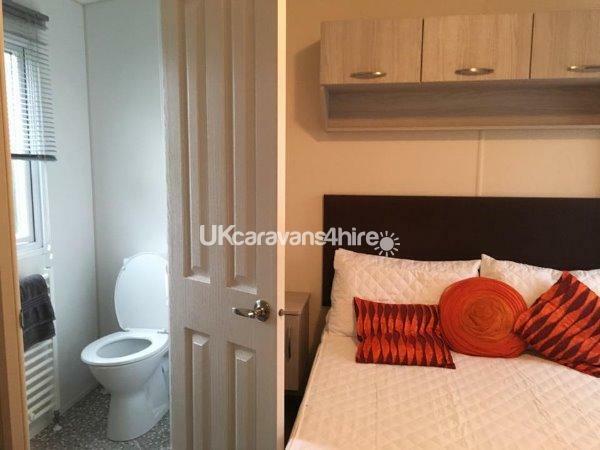 The caravan was great. The location of it was very quiet and it was lovely and clean when we arrived. We had excellent communication from the owners and will hopefully be booking again for next year. Fantastic holiday value for money loads of things to do here. Swimning pool was amazing all the lifeguards were fantastic including matt who was extremely helpful and brillant thank you so much lifeguards as well as matt we appricate it thank you the harrisons fanily. 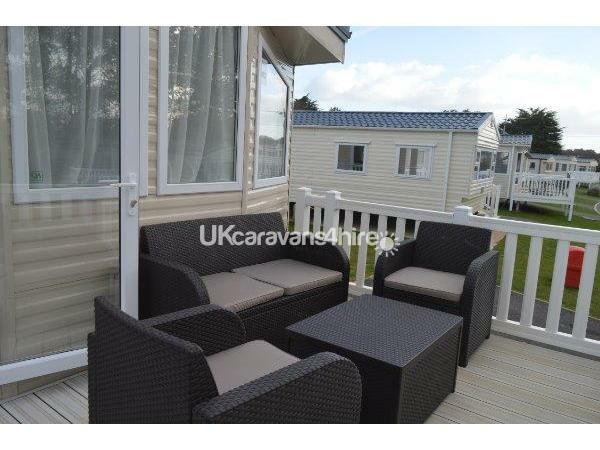 Had a lovely 12 nights at this caravan, everything we needed was provided and more! Beautifully clean and tidy and communication with the very freindly owner was great. I'm sure we'll return another year.